Taking a closer look at the front of the board, we can see the 5x5 LED array that you can use as a light sensor, a tiny screen to draw on, display words, numbers and other information, and the two programmable buttons! On the back of the board you will find the brains of the micro:bit, a 16 MHz, 32-bit ARM Cortex-M0 microcontroller with 256KB Flash, 16KB RAM and a built-in temperature sensor. Additionally, the back of the micro:bit is populated by an accelerometer, compass and Bluetooth Smart antenna, as well as a microUSB and two-pin JST connector for different power options. Finally, at the bottom of the board you will find 20 gold-tabbed edge pins and five ring connectors (three for digital/analog I/O, two for power and ground) for hooking up external components. The tabs with larger holes can be easily used with alligator clips to prototype added components quickly. 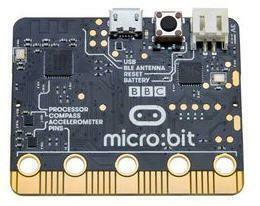 Ordering information: Important–The micro:bit does not include any cables or power sources. This is just the board. We recommend picking up a micro:bit AA battery holder or a micro USB cable as well to power your board. The set of 300 includes 300 micro:bits and 300 start-up guides.